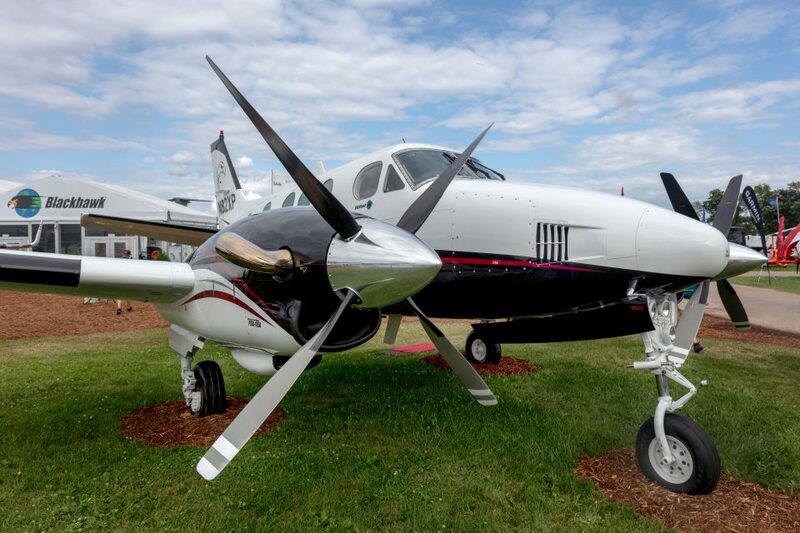 Blackhawk Modifications has sold 800 of its XP engine upgrades with the delivery of a Phoenix-edition King Air C90-1 with its XP135A engine upgrade. The company also announced that flight testing of its latest program, the XP67A engine upgrade for 12,500-pound and 14,000-pound-gross-weight models of the King Air 300, is underway and that it is continuing a $50,000 pre-certification discount on orders for that program, first announced this summer. The Phoenix-edition 1982 King Air C90-1 on display at EAA AirVenture 2018 where 800th customers Gregg and Jan Goodall first saw the airplane. Blackhawk expects the XP67A upgrade for the King Air 300 to deliver improved performance, including a maximum cruise speed of 345 to 350 knots, time to climb from sea level to FL350 in less than 17 minutes, and better performance at higher density altitudes. The upgrade includes two new P&WC PT6A-67A engines with a factory new engine warranty of five years/2,500 hours, installation drawings, STC paperwork, approved flight manual supplement, instructions for continued airworthiness, training from FlightSafety International for PT6A line maintenance, and a two-year subscription to P&WC engine maintenance/parts manuals. Qualifying core PT6A-60A engines will be trade-in credited at $70 per hour each for time remaining on the 3,600-hour TBO. The STC flight test program for the XP67A upgrade for the King Air 300 will include measuring parameters such as single- and multi-engine handling, aircraft performance, engine and accessory cooling, stall speeds and characteristics, landing characteristics, propeller noise and vibration, and high-speed airframe/engine characteristics. Blackhawk expects FAA STC approval for the upgrade next summer. Blackhawk’s Phoenix program allows owners of legacy King Airs to upgrade from a menu of options, including engines, avionics, and paint and interior. Blackhawk’s 800th XP upgrade, a 1982 King Air C90-1, was delivered to Gregg and Jan Goodall of Breckenridge, Texas, and replaced the stock PT6A-21 engines with the XP135A engine upgrade, generating a 36 percent increase in available horsepower, a 59 percent increase in climb rate, more than 270 knots maximum cruise speed, and a 19,000-foot single-engine service ceiling. The Goodalls also opted for Phoenix signature paint and interior design, the Raisbeck Epic package, and new Garmin glass-panel avionics including two G600TXi displays, WAAS-enabled GTN 650 and 750, GTX 335 transponder for ADS-B Out, and the L3 Lynx transponder for ADS-B In and Out.